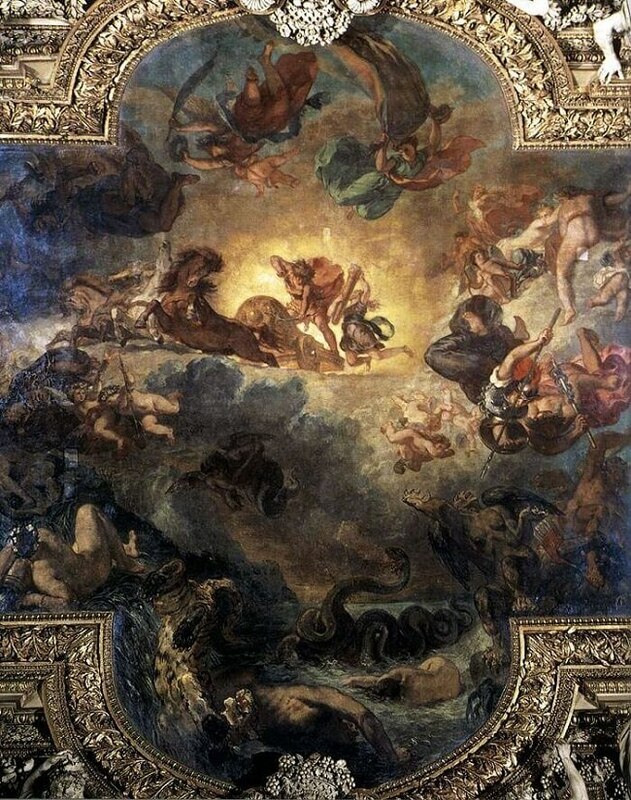 Apollo Slays Python decorates the ceiling of the Galerie d'Apollon in the Louvre. 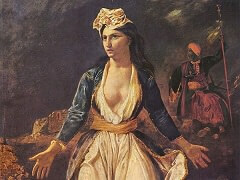 Delacroix's greatest virtuosity was reserved for a project which came in 1850, between the decoration of the Senate and Palais Bourbon libraries and the monumental Salon de la Paix at the Hotel de Ville, and was the most important commission of Delacroix's life. It was nothing less than the decoration of the Galerie d'Apollon in the Louvre. Following a fire, Le Vau had reconstructed this historical gallery for Louis XIV, while the decoration was entrusted to Charles Le Brun. Then in 1678, Louis left Paris for Versailles, and work ceased. 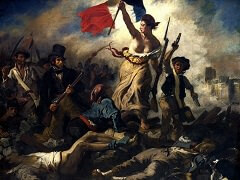 In 1793, in the wake of the French Revolution, the Louvre became a museum, and the Second Republic deemed the completion of the decoration a republican duty. Le Brun had intended a subject dear to the heart of the Sun King: Apollo on his chariot. 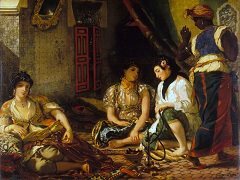 For Delacroix, to make his mark at the very heart of the Louvre and to do so not by exhibiting paintings but by decorating the central part of a ceiling was a thrilling opportunity. 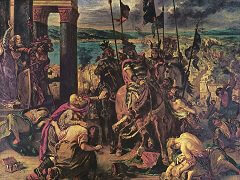 Before he began, he felt the need to study the works of Rubens in Belgium. In his Apollo Slays Python, Delacroix retained Le Brun's ambition to portray the mythological figure of Apollo in the gallery of that name. But Delacroix enhanced Le Brun's allegory with a further allegory close to his own heart: intelligence wrestling with barbarity and light struggling with darkness. 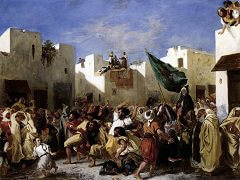 By emphasising the contrast between the two parts of his composition, the world of the sun above and that of darkness beneath, Delacroix transformed Le Brun's project and raised it to the plane of an eternal symbol. 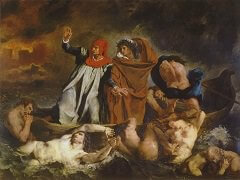 The subject, which Delacroix took from Ovid's Metamorphoses, is effectively the victory of Good over Evil. But it takes the form of beauty vanquishing the ugly and genius dispelling stupidity.